Can You Prevent The Second Darkness? Paizo Publishing and Q-Workshop are proud to bring you the 100%-official Pathfinder Second Darkness Adventure Path dice. 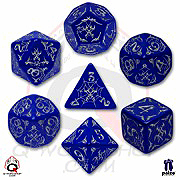 Each of these 7 sinister dice bears one of the demon-tainted runes of the merciless dark elves, undisputed tyrants of the realms below. Follow the ways of the drow and dare to defy the darkness.